Beaded chainmaille jewelry tutorials are less common than standard chainmaille jewelry patterns, and I thought it was time that I did a video showing some patterns with beads. This is a project video, where we’ll make a bracelet. I also will show some other design options. Oh, and why do I say “Video 1”? Naturally, I plan for more beaded chainmaille jewelry patterns! Now I have a lot of different chainmaille bracelets — right now I’m wearing a roundmaille, a Turkish roundmaille and a Jens Pind. But up to this point I hadn’t done anything with beads, except as a dangle off an earring. 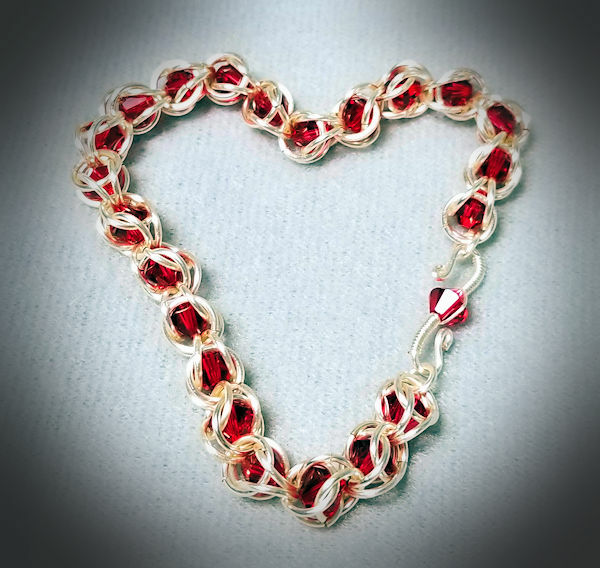 Beaded chainmaille is a change of pace — and I am looking forward to making a bracelet incorporating sterling and pearls. All of the ring gauges list below are AWG. When I say 18 gauge, I mean a 1mm wire diameter. 6mm bicone beads — I am using Swarovski, in the color Scarlet. If you want to make the green and gold bracelet, you’ll need more of the smaller jump rings and fewer of the large jump rings and bicone beads. And if you want to add a dangle or charm, you’ll need to include those. Ready…set…let’s get maille-ing with this beaded chainmaille bracelet!